Yesterday the LRO team released a new image of the Apollo 14 landing site. You can clearly make out the paths that the crew walked as well as the location of the Apollo 14 Antares Lunar Module Descent Stage. 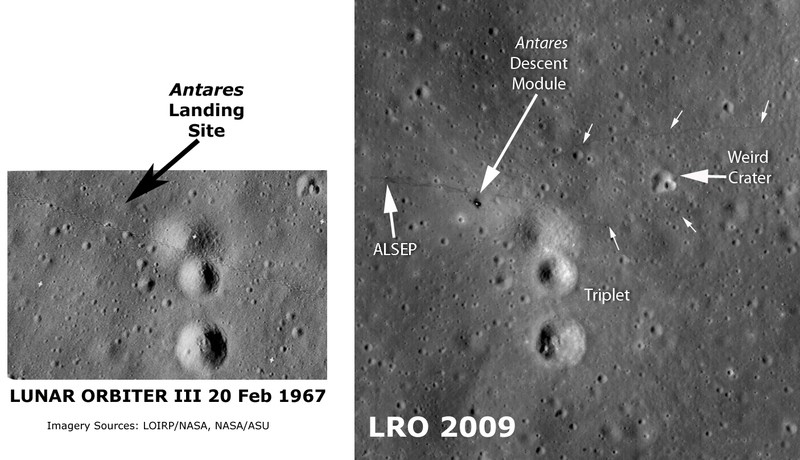 In June 2009 LOIRP issued its own view and analysis of this landing site – as seen by Lunar Orbiter III back in 1967. 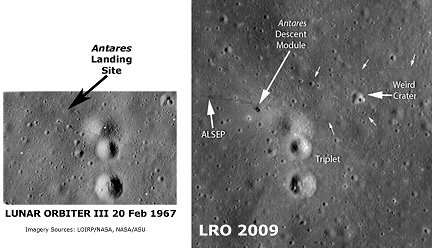 Comparing our high resolution image of the site with that taken by LRO clearly shows no feature where Antares’ Descent Stage now stands [larger image]. While the resolution of the Lunar Orbiter image (0.8 meters/pixel) would probably not reveal astronaut tracks in great detail, we’re rather certain that it would have seen an object the size of Antares’ Descent Stage. As such, we’re pretty certain that the Apollo 14 mission landed on the Moon! These photos from the Lunar orbiter image restoration team confirms to everyone that MAN HAS LANDED AND WALKED ON THE MOON! The photos taken before and after the Apollo-14 mission are the nail in the coffin to any who have believed that this was somehow staged. These photos and the voices of 400,000 men and women who led us in the Apollo landings can no longer be ignored. Now we need to go back…for them and our future! Suggesting that this was photoshopped is really sad and displays an astounding lack of understanding of anything technical. Must be an incredibly lame life for someone who thinks this. The Space Shuttle is a much more complex machine than Apollo, so trying to fall back on some sort of belief that Apollo was faked is sadly lame. I feel sorry for what must be your life experience. Editor’s note: yes, that is why I posted it! I went and plowed thru the apollo lunar surface journal and found the traversal plans, so it’s interesting to see what they PLANNED to do vs what they actually did – pretty close, but the ground tracks do deviate from the plan a bit – exactly what you’d expect from a man on the ground looking at actual terrain as opposed to what the controllers planned. BTW: send any moon-hoaxers to the ALSJ site. The amount of info there is INSANE. Ask them to look at it even for 10 minutes, estimate how many people it took to just make those 100’s of pictures, transcriptions, plans, etc. IN THE LATE 1960’s, and then have them look you straight in the eye and swear that all those people help their mouths shut for 40+ years. Ugh! If you think all these are faked, just leave the forum. I think the point is that while we all understand that it wasn’t photoshopped, anyone delusional enough to believe that we didn’t land on the Moon could easily say that it was. The lack of technical understanding is yours, not that of the previous poster. My elementary school aged daughter could do this, and has that technical understanding. The delusion is that pictures like this, so compelling to 99.99% of the population, can’t be argued away by the deniers, whose life must indeed be incredibly lame in order to want to do so. See, these deniers can’t be argued with, but are best just ignored. Let’s not pat ourselves on the back and tell ourselves that their case is disproven by these new pictures, since their arguments are sufficiently malleable to weasel out of any such disproof. Obviously, they could say, the LRO controllers are just as dishonest as those who did Apollo. Congratulations to the LRO team on some marvelous work. What idiot would say these photos are photoshopped? Definite proof that we’ve explored the moon is given and yet the fools are still in denial. WE LANDED ON THE MOON AND YOU ARE WRONG. ACCEPT IT AND GET ON WITH YOUR MISERABLE LIVES. OK, if we still have dough heads out there who believe their hoax theory, here’s what you do. Find all the sites where we’ve landed on the moon. Include the Luna 9, 17, and 21 sites, just for laughs. and while we’re being complete, how about the impact sites for the ascent stages, Ranger, and Luna programs in general. That way, it proves the Russians were in on the hoax too. Even while they were trying to beat us to the hoax! Oy vey! How stupid can people be? Well NASA is late to the game I found tracks in the previous photos they didn’t mention on the 14 and 15 photos. my name is the link to my youtube channel these animations where done when the first LRO Apollo images were released.